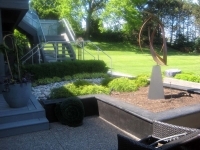 Each Inspired Landscape project stems from an examination of the natural and built environments and the interactions between clients and their surroundings. The design process begins with listening, observation, and analysis. By actively engaging the client throughout the design process, during construction, and after installation, the studio ensures that all of the project's goals are realized and that each landscape evolves and thrives over time.